Will Kazan become a tourist mecca after the XXVII Summer Universiade? July 2013 will be very important time for Russian tourist, it’s necessary to be in all glory because Tartarstan’s capital Kazan is expecting to receive more than one million tourists and 13 thousand athletes from 170 countries. The XXVII Summer Universiade will start the 6th of July but preparations to it have begun considerably earlier, and all this event costs more than $ 4,3 billion. Now specialists are calculating not only building scales but corruption scales too. Sochi-2014 and Kazan-2013 (like APEC in Vladivostok) are the most expensive sport and tourist projects in Russia last years. Account Chamber of Russia is running off its legs trying to count charges of Olympic Games in Sochi (now the sum of money is more than $ 50 billion). It’s not difficult to guess that the Universiade and the Olympic Games are the projects oriented to show power and steadfastness of Russia. Certainly it’s fascinating to count somebody’s money but let’s speak about something more pleasant. Today I’m interested in Kazan and let me look what important things and objects for Russian and foreign tourists will be realized there this summer. 64 objects will be brought into play to organize competitions. Especially to this event 34 objects have been built or are being built now. 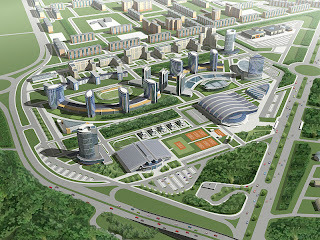 The biggest buildings are Football stadium for opening and closing ceremonies (45,000 seats), Central Stadium (27,000 seats), TatNeft Arena (10,000 seats), Basket-Hall Arena (7,500 seats) and Universiade Village which can host over 13,000 people. Aquatics Palace, Tennis Academy, Rowing centre, Saint Petersburg Volleyball Centre, Gymnastics Palace have capacity less 5,000 people but for Kazan they are something unaccustomed. Also a lot of money were assigned to building and reconstruction of transport infrastructure. More than ten flyover, 23 highways, 73 streets are constructed or renovated. 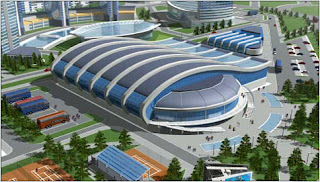 The second subway line, new tram line, aero-express line to international airport “Kazan” were built. Tartarstan’s capital is ready to receive guests, “the guest card” will appear in the city. This card will be available since 1st of March. Now it is not known how to became card-owner but indeed it’ll give big preferences: free enter to five museums, several public transit trips, discount in some Kazan’s souvenir shops and restaurants. Three information stalls, 30 maps, 51 pedestrian indicators and 21 memorial indicator will appear by this summer. Also all street names will be translated into English. 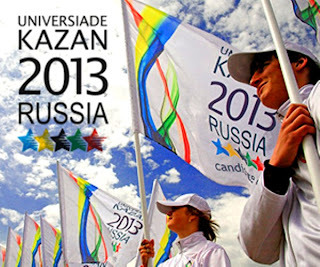 Information technologies must serve Universiade and new free iPhone and iPad application will be launched, it got a name “Discover Kazan”. This application will be in English, Russian and Tatar and it’ll give information about tourist routs and main sightseeing. In May the application “Virtual History” will appear and it’ll give possibility to see historical buildings in retrospective. Last year multi-language call-centre began to work. Soon it’ll be very difficult to find places in Kazan hotels. Universiade’s capital is ready for tourists. But the main question is very sore. And it also concerns Sochi. Will these cities became tourist mecca next years or they’ll be forgotten. Will Kazan’s $ 4,3 billion and Sochi’s $ 50 billion come back to state, regional, municipal budget and to investors? Will tourists and sportsmen return there after these pompous and done for effect competitions?